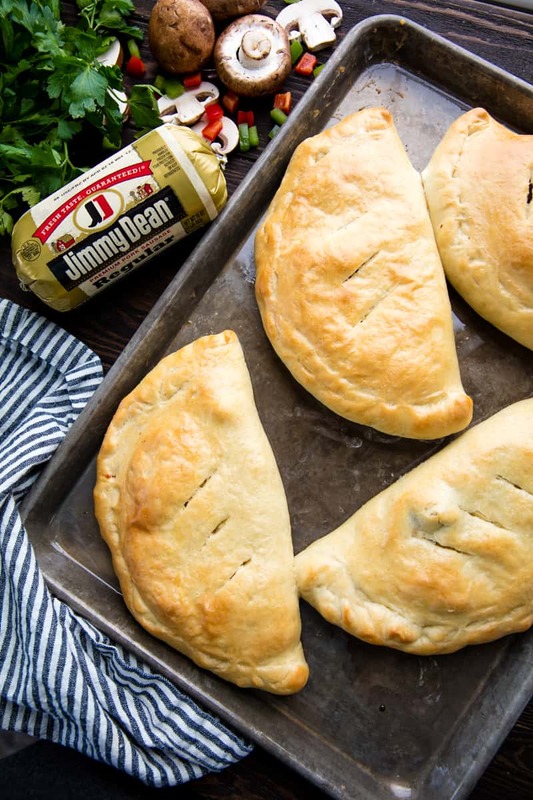 This Sausage and Cheese Calzone has a made-from-scratch dough that’s stuffed with flavorful sausage and cheese for a delicious dinner that is sure to please. This recipe is sponsored by Jimmy Dean. All opinions expressed are my own. What is the difference between a stromboli and a calzone? Both stromboli and calzone are a type of turnover filled with meats and cheeses. A stromboli is made from a rectangular piece of dough that has been topped with fillings. It is then rolled into a log shape and baked. A calzone is made from a circular piece of dough and the fillings are placed in the center. It is then folded into a half circle shape and baked. Calzone is an Italian word that refers to a folded pizza. Calzone originates in the Naples region of Italy. 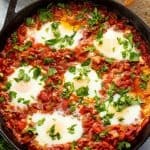 What kind of sausage should I use in this recipe? This recipe requires a fresh sausage that needs to be cooked. We recommend Jimmy Dean Premium Pork Sausage. They have several different flavor options so you can choose from Regular, Hot, Sage, or Maple to give your recipe a unique twist. We personally prefer Regular or Hot in this recipe. Can I use a different type of cheese? Yes! This recipe calls for shredded mozzarella cheese, but you can switch things up and customize this recipe to your own personal taste preferences. Shredded provolone, fresh mozzarella, gouda, or even cheddar are all great options. The important thing to remember is that you just need a cheese that melts well. Watch the video below where Rachel will walk you through every step of this recipe, including tips and tricks along the way. Sometimes it helps to have a visual, and we’ve always got you covered with our cooking show. You can find the complete collection of recipes on YouTube, Facebook Watch, or our Facebook Page, or right here on our website with their corresponding recipes. 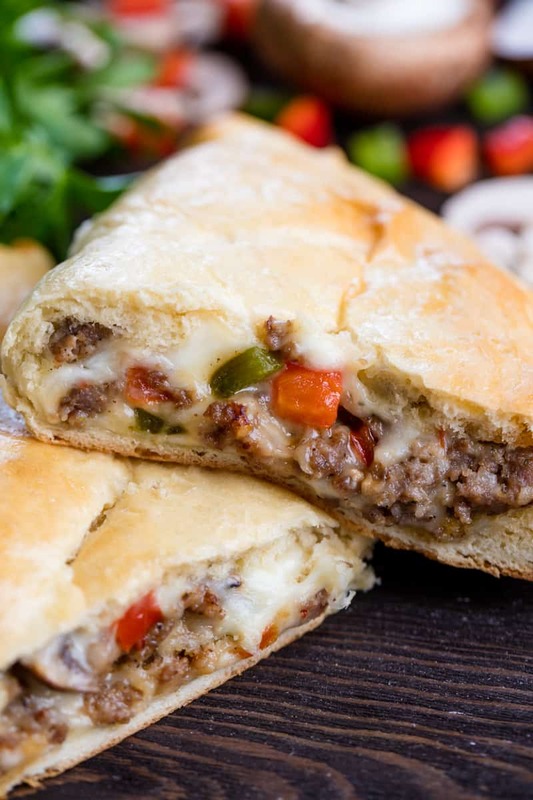 This Sausage and Cheese Calzone has a made-from-scratch dough that's stuffed with flavorful sausage and cheese for a delicious dinner that is sure to please. In the bowl of a stand mixer, combine yeast, brown sugar, salt, water, olive oil, and flour. Knead on low until dough starts to come together. Continue kneading until the dough forms a nice, soft dough ball and the sides of the bowl are clean. Let rise in a lightly greased bowl, covered, for 1 hour, until doubled in size. Meanwhile, make the filling. Heat a large heavy skillet over medium-high heat. Add in sausage and cook 5 minutes. Use a spatula to break up the sausage into crumbles. After 5 minutes, add in the bell peppers and mushrooms. Continue to saute until vegetables are tender crisp and sausage is cooked through, about 5 minutes. Divide the dough into 4 equal pieces. Roll into circles with a 12-inch diameter. Spoon the sausage mixture onto one half of the dough, leaving a 1 inch edge. Top with 1/2 cup cheese per calzone. Fold the dough over the filling and seal the edges. Transfer stuffed calzones to a lightly greased baking sheet. Use a sharp knife to make three slits in the top of each calzone to allow steam to vent. Bake in a 400 degree oven for 15 to 20 minutes until bread is golden brown. Serve hot. Oh my gosh- SO delicious!! It’s my hubby’s new favorite! Thank you so much for sharing!! What goes in a Calzone? What goes on a Pizza… There is your answer. Personally I do not like sauce inside, prefer to use warm sauce as a dipping sauce. This calzone is excellent. The only thing I added was a knob of garlic butter to each calzone before baking. It was delicious. Thanks Rachel. A bit americanized, but altogether scrumptious!!! You can put what ever you want to put in it people. Anyway…. if I handed my son a calzone on a plate and it wasnt filled some kind of meat, he’d look at me like I was nuts lol. Adults dont want a calzone with just cheese. Thats just a cheese sandwich. Give her a break. I totally agree, Carol. Thanks for responding. I’m sure you can! I prefer homemade myself. In fact, I’m not even sure what brand of store dough you’d buy as I don’t ever buy it 🙂 But I do know they sell it!